In this letter to George W. Martin, Charles R. Green addresses information related to the Sac and Fox tribe. Green, proprietor of Green's Library and Museum in Olathe, Kansas, explains that he interviewed a missionary named Samuel Black, who once served as a missionary for the Sac and Fox. Green explains that Black assisted in recruiting African American men to fight in Company K, 1st U.S. Colored Troops. 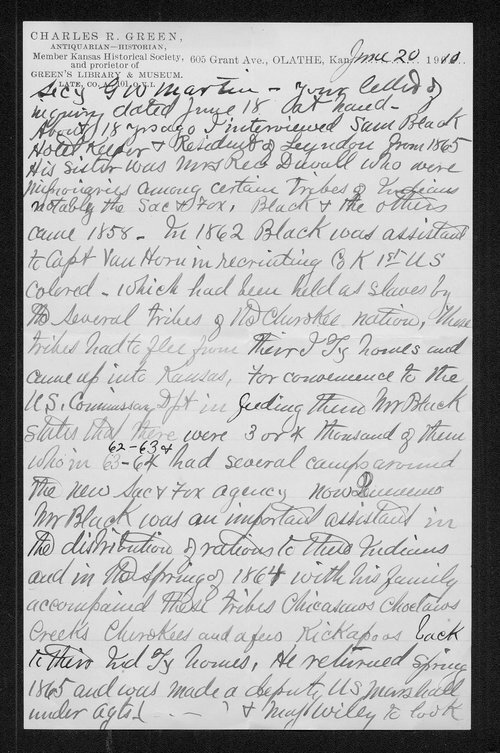 Collections - Manuscript - Ferris, Ida M.
People - Notable Kansans - Green, Charles R.